Nearshore fishing typically means you are fishing within sight of land. You can fish in the ocean without going all the way to the Gulf Stream. There are a variety of nearshore reefs, wrecks and beaches around Charleston offering a variety of species of fish to catch. These intermediate trips range from 10 to 30 miles offshore. Anglers can spend their time bottom fishing or trolling. Nearshore trips are available aboard Full Circle – a 34-foot Custom Carolina Fisharound. Nearshore trips range from 6-12 hours. 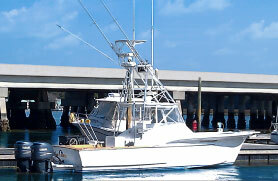 Nearshore trips range from $1,100-$1,7000 and can accommodate up to six anglers.